OK talk to me about replacing fluorescent light tubes. I never have. My set up has been expanded over time, so some are newer, but some of the original ones are over a decade old. How do you know when they need to be replaced? I've been worrying about it this year, because in some ways I'm not getting as good of results as I'm used to. But there are several variables, seeds I bought cheap in bulk from a company I've never tried before (I'm suspecting the seed for some low germination rate issues), homemade potting soil, and aging light tubes. But you can't recycle the tubes and I hate to be throwing them out, it seems so wasteful. They still light up and look the same. I base my need to replace decision on dark shadows developing at the ends of the tubes, but dedicated people replace them every year or after each "run" regardless. New tubes definitely are brighter, so you may want to keep a "test tube" to compare against existing ones. "Daylight Deluxe" which is marked 6500K and 2750 lumens. But they also sell "Daylight" which I believe was 6000K. Standing in front the huge aisle of f. Tubes, I got confused. After coming home, I reviewed my notes and asked around, and you do definitely want 6500K or higher for starting seeds (blue lights) for good foliage growth. I also mistakenly thought 5000K would be good enough for the "warm" range for blooming/fruiting, but I was told that this color range doesn't do much/as well for plants and they need the 4100K (red lights) -- Actualy called "Cool White". In addition, last time I was poking around the web, I read that you could put T-8 tubes in T-12 fixtures and still have them work. But last night, I dug a little further and stumbled on an electrical contractor's forum. In a discussion there, consensus was that T-8 tubes/bulbs used with T-12 ballasts shorten the bulb life (and T-12 tubes/bulbs used with T-8 ballasts shorten the ballast life) -- uh oh. One contractor cleverly remarked that mistakes like this by maintenance crew means more extra work orders for them. In addition, one person commented that T-12 ballasts last forever (longer than T-8) so one idea wod be to stock up on T-12 tubes before they stop selling them.... But another idea would be to replace the T-12 ballasts with T-8 ballasts which I read once before elsewhere that it is not difficult to do ...then again, T-12's are not as bright as T-8's nor as energy saving. So what to do? Anyhow, back to the store I go to exchange the T-8's and get some T-12's also. I wonder if you can exchange/return items bought at another Home Depot store at a store closer to my house? P.S. recycling -- I suppose you could offer them for freecycle/Craig's as used but still usable tubes? Mean they'd be fine for general lighting until they burn out (tube ends turn black and they don't turn on, start flickering or tracering). When they do burn out I take them to my township's hazardous collection site. I did mean to ask if they had a collection box for the tubes at Home Depot (or other big box stores) like they do for CFL bulbs. I'll do that when I go back. P.P.S. Maybe you could have a sun-loving seed starting section where you would keep replacing the tubes, and shade-loving seed starting section where you can keep using the older tubes. I have T-5's in my 24" section and T-12's in my 48" section. I am running 2700k and 6500k bulbs in each set. There is not much growth difference between the sides. - 6500K is supposed to be significantly better/ideal for leaf and root growth and I'm not sure how much 2700K color range benefits plants (I was told to choose 4100K for blooming/fruiting) I'll see if I can find an appropriate graph to link to. Right now, there are 32 in the tray, but if I take them out of the square bakery containers, the tray would hold more. 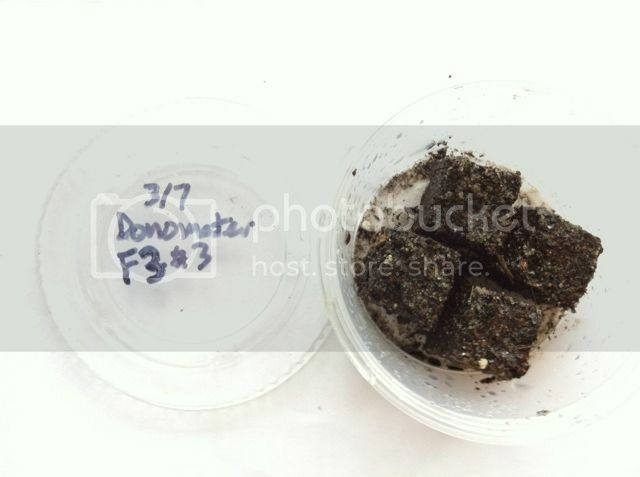 ...this is weird to me because I usually bury up to the base of seed leaves, but the soilblocks are supposed to encourage dense root systems so I'm going to follow through and see how they do. Those Cherokee Tigers sure stand out don't they. 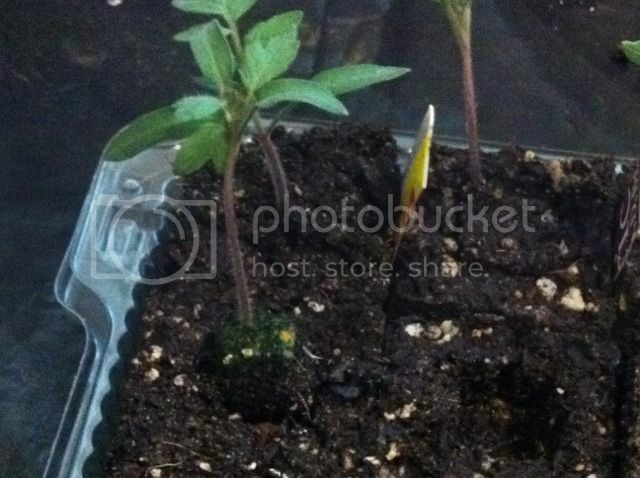 So, if I'm reading your thread right, you planted tomato seeds on 2/18 and 2/20? I planted mine on 2/22 and yours are visibly ahead of mine, possibly more than 4 days can account for. Most of them are putting out their first true leaves now. I moved the first ones from crowded in cells on heat mat to one/cell off mat. Those were Wayaheads and they are noticeably ahead. They were also seeds from 2007 and had a better germ. 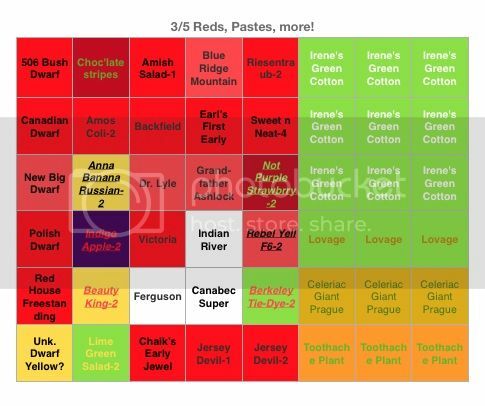 rate than some of the new seeds. The next to get moved off the mat will be the Sophie's choice, another early variety. So even at this stage the early varieties are getting off to a quicker start. 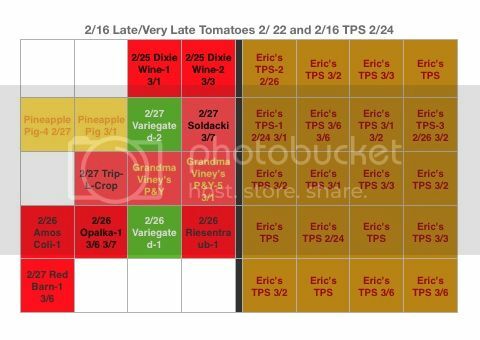 Huh, there's a discrepancy in my notes -- 4 Late/Very Late varieties (Kamatis Tagalog, Grandma Viney,s Pink and Yellow, Pineapple Pig, and Wes) were started on either 2/16 or 2/17. 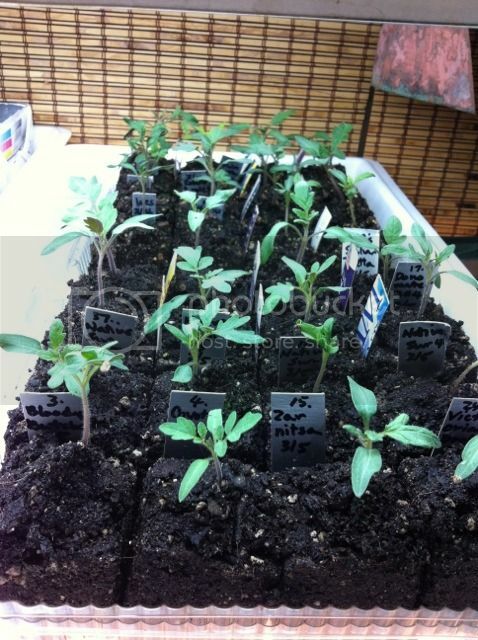 Winter Indoor Trial varieties were started on 2/19. More varieties were started as microblocks were Upblocked. I started the main garden varieties on 2/26 (did I not mention that?) and the last batch (I think!) of tomatoes yesterday. Temperature may explain it too -- many early varieties grow well at lower temps. On the other hand, the middle shelf of the "Tropical Paradise" (inside the pvc covered shelves) is upper 60Ã¢â‚¬â„¢s to low 70's during the day and low-mid 60's overnight. 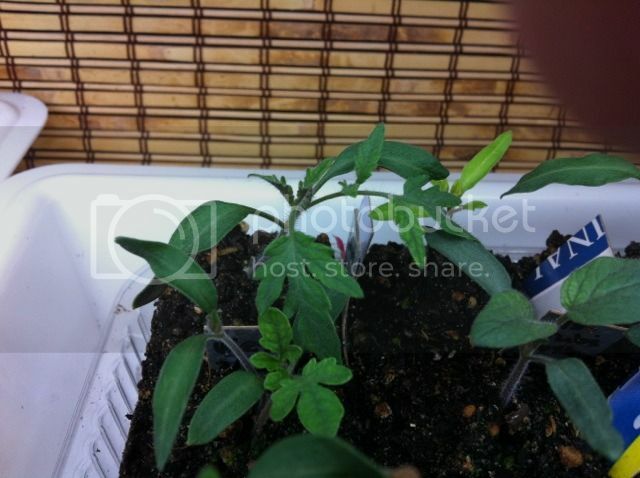 -- this is a temp range in which tomatoes grow very well, sometimes too lanky. Humidity level is higher. 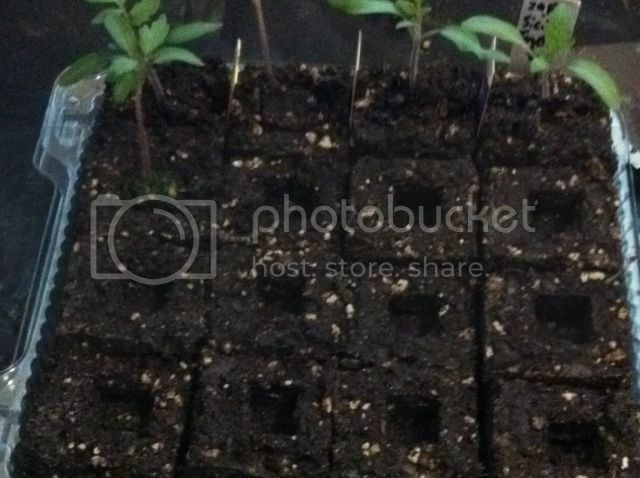 I prefer to grow them somewhat slower and stockier, so the Upblocked seedlings in 2" microblocks are moved to the top of the Tropical Paradise -- no more cozy indoor "greenhouse" and temps will be upper 60's by day and low 60's by night with occasional drop down to upper 50's. @Jardin du Fort -- V8 NURSERY -- I LOVE it!! OK, so that's more than just one question, but hey, who's counting anyway! Tomato flowers have conical structure of fused anthers called an "anther cone." The pollen is released INSIDE this structure. Excess pollen comes out of the opening at the point of the cone. Most tomato flower's pistil (female receptive part which catches the pollen) does not grow longer than the cone and does not emerge, so that when the flower releases the pollen, it's own pistil catches the pollen and are pollinated. 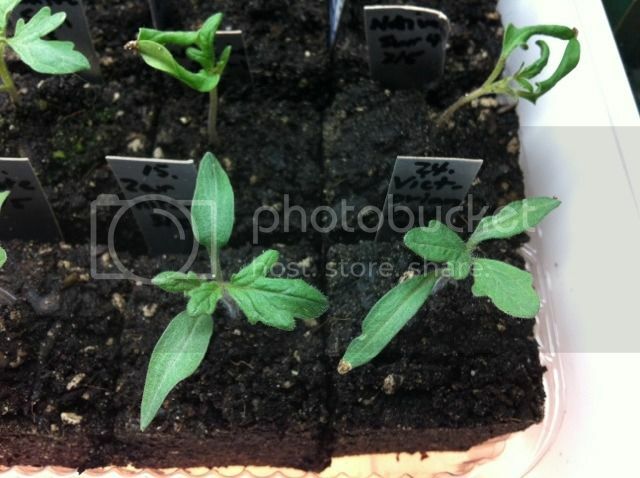 This means that most of the time, a non-hybrid genetically stable open pollinated or heirloom tomato plant can make uncrossed seeds that are true to type. Some varieties do have protruding pistil that are more susceptible to cross pollination by wind as well as by insect activity. And insects, especially ones that tear open the anther cone to get to the pollen and maybe nectar too, can introduce pollen from other flowers. I suspect hummingbirds may also have a hand -- beak -- in the process since they visit tomato flowers while visiting my garden. To be completely sure, I should BAG the blossoms, and I may bag some, but probably not all. Last time I tried bagging tomato blossoms, it was an exercise in frustration. The nylon bags (drawstring wedding/party favor bags) tended to overheat the trusses and/or caused excess moisture humidity, resulting in every truss BUT the bagged ones to set fruit. I'll try again since obviously, I don't have the technique down. Also, I want to try intentionaly crossing some of these myself by hand pollinating -- and those will need to be bagged to prevent unwanted help by outside sources. 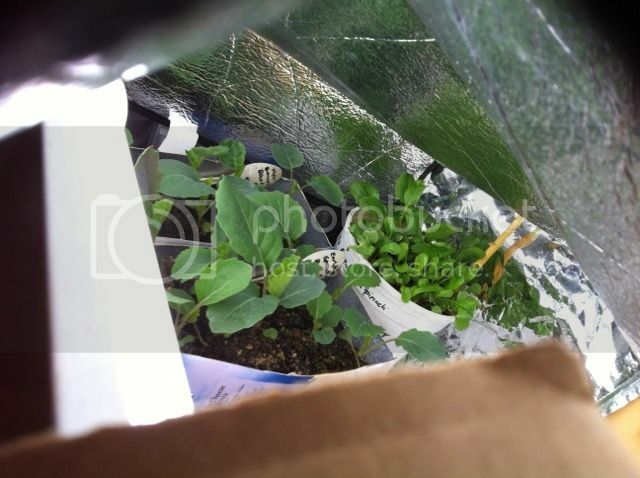 Broccoli seedlings in the garage. Forecast still calls for windchills of 19Ã‚Â°F then 20's so not quite ready for them to go out, though I'll set them out to harden off again once this gusty weather passes. They took longer to sprout and to grow, although if you look close almost all of the microblocks have sprouted now. I think next time, I'll start these earlier with the onions in January. 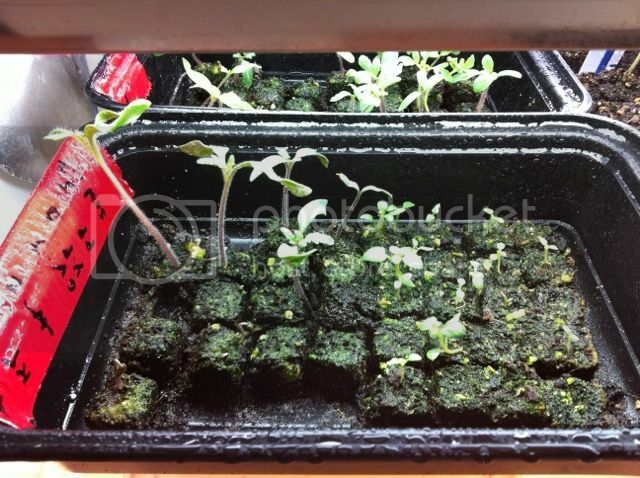 I'll upblock those bigger ones within the next couple of days when I upblock those bigger tomato seedlings.